I'm honored & delighted to hit the road for the first time to Austin to rock with Bop Alloy & Bavu Blakes. This will be a great time. 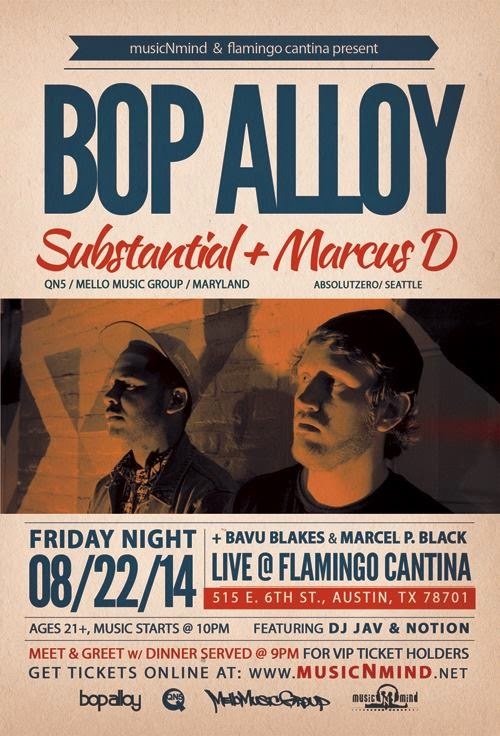 You can get your pre sale tix @ http://musicnmind.wordpress.com/2014/07/13/aug29flamingocantina/. Check out Marcel's interview with Marcel P. Black about the current state of Hip-Hop in Baton Rouge. Baton Rouge, in many aspects, would be regarded in a sad state of affairs. High murder rates, abysmal public education and an ever-present drug problem have affected the city for years. Though these problems plague a large part of the community, many young people have sought music as their outlet of expression, and, ideally a ticket to a better life. Black, who performed Saturday at the Spanish Moon as part of The BR Hip Hop Project’s “Hip Hop is Alive” show, realizes the abundance of problems in Baton Rouge like many others, but unlike most, can see how they are sometimes spun in a positive direction. Marcel P. Black, a youth development worker by trade, has spent over a decade traveling the Southern and Midwestern States performing his music. Black has settled down across the South, including stints in Oklahoma and now most recently Baton Rouge. Since witnessing first-hand the rise of hip-hop juggernauts Lil’ Boosie and Kevin Gates, Black has seen all the ebbs and flows that have been present in Baton Rouge’s rap scene. “In Baton Rouge, I mean around the same time [Gates and Boosie] were in jail, a couple rappers stepped in their place, like Young Ready,” Black said, “Baton Rouge had a pretty rich underground scene, which was kinda more reminiscent of Mos Def than Boosie or A Tribe Called Quest instead of Gates,” he continued. “Most of the guys was outta state and come 2010, there was a crop of kids from 17-21 who were really talented, and had a mix of traditional sound,” Black elaborated. “That side kinda developed a whole lot more in the absence of these big stars. Luckily, some of those guys were able to make a name for themselves,” he added before noting that Boosie is still the king of the Red Stick. Black’s recollection of Baton Rouge’s brief history filled with elusive and fleeting glimpses of almost making it big, serves as a reminder for those hoping to change the perception of Baton Rouge’s status in the music industry. 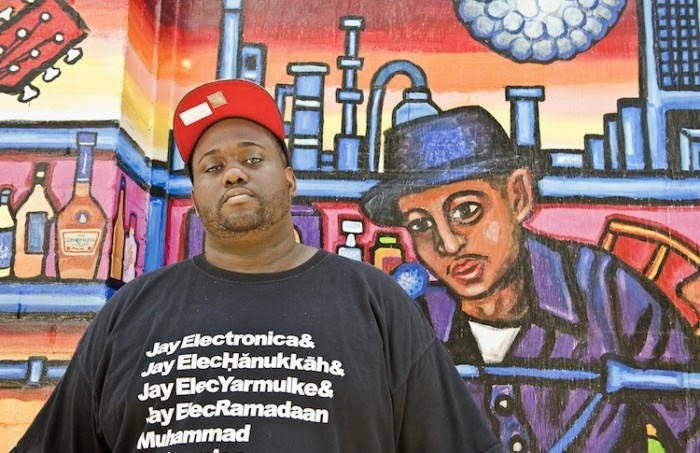 “It’s a business; just making good music ain’t enough,” Black asserted. “You need to understand copyrights, licensing and royalties because that’s how you monetize a situation. In a city that is often cast aside in favor of hip-hop meccas such as New Orleans, Houston and Atlanta, veterans of the game such as Marcel P. Black make their presence known to the younger generations. “We’ve been making great music and there’s some people wising up to it or whatever,” Black said, “Once we get more educated and work harder to find and engage our demographic and build our fan bases, I think we can’t be stopped. 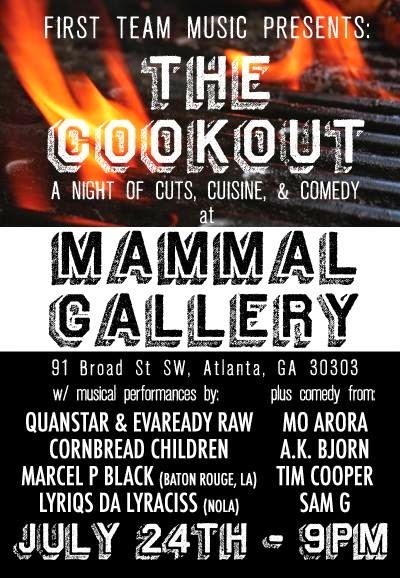 Marcel P. Black live in Atlanta Thursday July 24th. This will by my first time back in Atlanta since A3C last year. If you in ATL, come thru.